Whether it’s a business trip, holiday trip, or moving to a new city, better accommodation is all we look for. Finding a good city with nice accommodation and facilities can be hard. There are many online services that might help you a bit but most of them are not enough for making a decision. In this article, I will cover a service that provides you detailed information about the world’s popular cities. 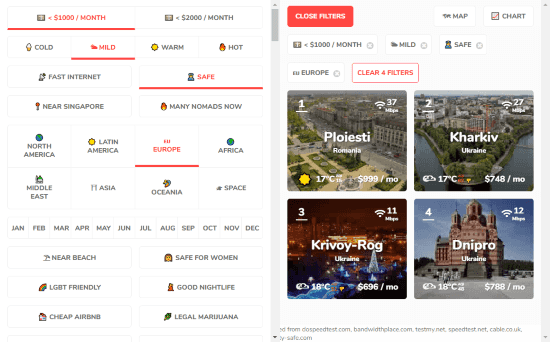 Nomadlist is a crowdsourced database of cities all around the world. It has a community of over sixty thousands people known as Nomads who help expand and keep the database updated. This service uses dozens of parameters to help you find the best cities. Based on those parameters, it lists the best cities along with remote job openings which can cover the cost of living. 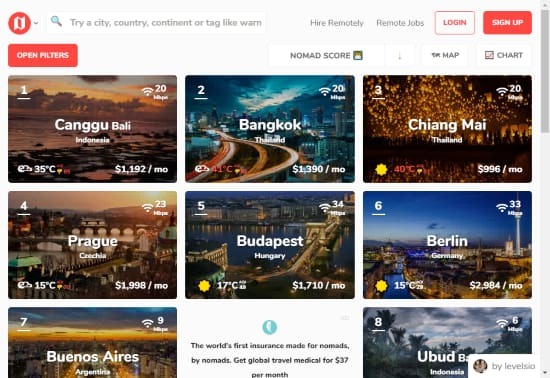 Nomadlist gives you a list of worlds top cities where you can find detailed information about those cities from living cost, to weather, safety, neighborhood, language, average internet speed, women safety, LGBT friendly, nightlife, and a lot more. Along with all those parameters, this service has a Nomad parameter that reflects the experience of Nomad community. On the homepage, you get a list of cities ranked based on all the parameters combined. The first 10 cities on this list are those which tops all the essential parameters for a better living environment. Apart from these, there are hundreds of more filters which you can use upon signing up to Nomad premium membership. Score: Shows you detailed stats and parameters of the selected city along with the average Nomad Score that city received based on the reviews from Nomad community. Nomad Guide: Brief details about the city such as weather, internet speed, air quality, power, best wireless carrier, best coffee place, visitors per years, and more. Cost of Living: Cost of living breakdown such as Nomad cost, cost of living for expat, cost of living for a family, cost of living for local, 1br studio rent in the center of the city, coworking cost, hotel cost per month, hotel cost per night, Airbnb listings along with per night and per month cost, price of dinner, Coca-Cola, Beer, and Coffee, etc. Reviews: Reviews peoples wrote about the city. People: A list of Nomads and member of Nomadlist who are living there or have been there. Chat: If you are a Nomadlist member, you can chat with other members here. Neighborhoods: A detailed map of the neighborhoods including the main attractions for tourists, students, hipsters, rich, and more. Coworking: A map of coworking locations and cafes. Forum: Nomadlist forum for Q/A. Flights: Flight details about that city listing all the flights to and from around the world. Videos: A video for neighborhood guide. Remote Jobs: Based on the city’s cost of living, a list of remote jobs that would cover the cost. Apart from all that, you can visualize a chart of all the cities around the world by selecting any two parameters for x and y-axes. 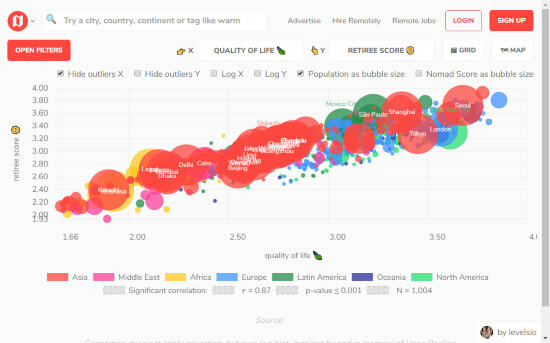 You can also visualize the population and Nomad Score of the cities in this chart. Find best cities to live with Nomadlist here. Nomadlist is a very useful service that provides various types of information about the world’s best cities in one place. It makes it easy to find the best cities to visit or move to all around the world.